WASHINGTON — President Donald Trump welcomed the NCAA national champion Clemson Tigers football team to the White House Monday with a shutdown smorgasbord of fast food offerings he called "great American food," including piles of pizza and fries and more than 300 burgers. 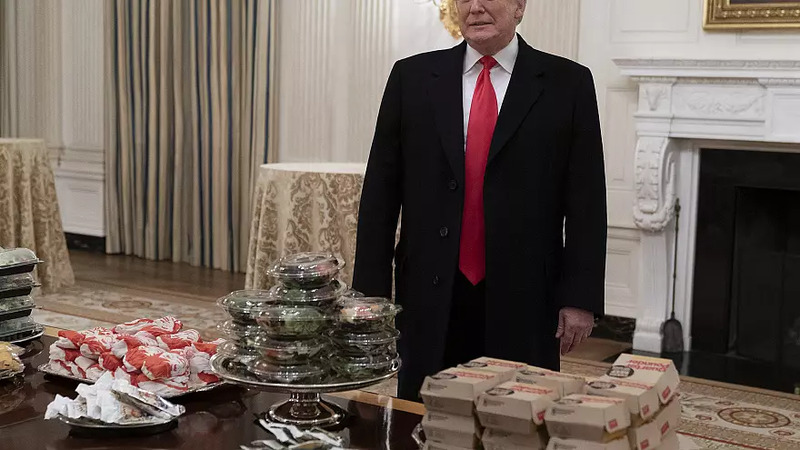 "Because of the shutdown, as you know, we have the great Clemson team with us, so we went out and ordered American fast food paid for by me," the president said in the East Room, standing behind a table loaded with offerings from McDonald's, Wendy's, Burger King and Dominos served on silver platters, behind a gilded candelabra. The president's decision to spring for the event came because much of the residence staff at the White House is furloughed during the shutdown, White House press secretary Sarah Sanders said in a statement before the event began. Ahead of the event, Trump told reporters he thought the selection would be a success because the team featured "very large people that like eating." The president praised the on-the-field exploits of the team, which he "To the athletes today, who have eaten more than anyone ever: You inspire America. You really have," he said later in East Room. In attendance were the South Carolina congressional delegation, Treasury Secretary Steve Mnuchin, Acting Attorney General Matthew Whitaker, Acting Secretary of Defense Pat Shanahan, Acting Chief of Staff Mick Mulvaney, Clemson University President James Clements, and the football team, coaches and guests. After the speech, the president ushered the team and coaches into the Oval Office for photos. The event marked the team's second White House visit in three years since it won the championship in the 2016 season. It also marked the first sports team visit to the White House post-championship victory since President Trump abruptly canceled the Philadelphia Eagles' scheduled June visit amid his criticism of NFL players who chose to kneel during the national anthem to protest police brutality against people of color.